Kareena Kapoor Khan and Akshay Kumar will be collaborating for the film 'Good News', directed by Raj Mehta and co-produced by Karan Johar and Akshay Kumar. The film is about surrogacy. It also features Kiara Advani and Diljit Dosanjh in pivotal roles. In the film, Kiara and Diljit will be seen as a married Punjabi couple who are trying to conceive a baby. Kareena Kapoor Khan and Akshay Kumar worked on films like "Tashan", "Kambakkht Ishq", "Ajnabee", "Aitraaz", "Bewafaa", "Dosti: Friends Forever" and "Rowdy Rathore". 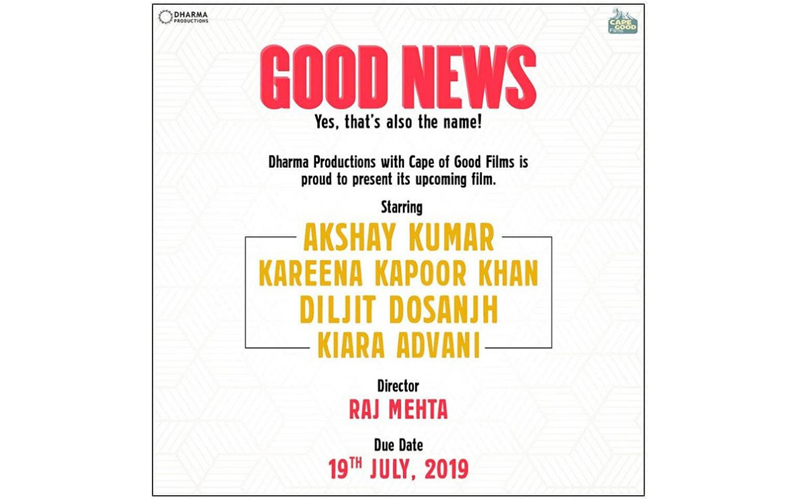 Akshay took to Instagram and made the announcement by sharing a poster with a caption, "Good News! That's the name of our film and so is the news I am sharing :) It is a ‘dramedy’ Due Date 19th July, 2019". “Good News” is slated to release on 19th July 2019.